Ready, Steady, Go e-book contains the 3 shawl patterns that are especially designed for beginner lace knitters to help to understand and practice lace knitting techniques. This is the second part of my lace knitting course. 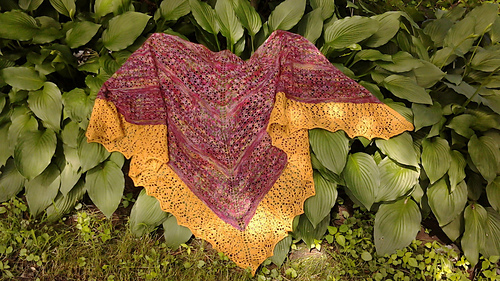 This shawl might look difficult to knit, as the lace sections are significantly longer than the garter sections, but the lace instructions are easy to follow and only basic increases or decreases are used, so that beginner lace knitters can handle them without problems. 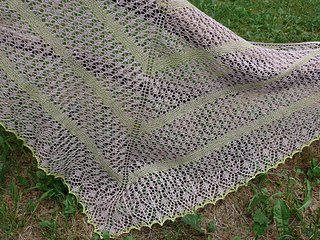 The result is an airy, classic triangular shawl that can be used in any occasion, depending on your color choice. 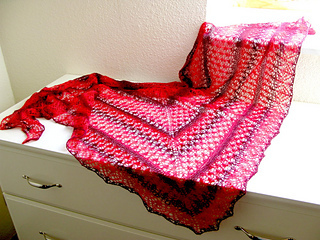 Beginner lace knitters looking for challenges can knit it in two colors. Needles: 3.5 mm (US 4) circular needle, at least 100 cm (40”) long (or any size that gives you the right gauge). Notions: tapestry needle, 4 stitch markers. More stitch markers to separate repeat sections, if requested. Gauge: 17 sts x 36 rows in 10 cm (4 inches) in lace pattern. Please note that in this particular project getting the right gauge is not essential. However, working with different yarnweight / gauge will effect both the yardage and the final size of the project as well.